Story: From Academy Award nominated filmmaker, Charles Ferguson (No End in Sight), comes Inside Job, the first film to expose the shocking truth behind the economic crisis of 2008. The global financial meltdown, at a cost of over $20 trillion, resulted in millions of people losing their homes and jobs. Through extensive research and interviews with major financial insiders, politicians and journalists, Inside Job traces the rise of a rogue industry and unveils the corrosive relationships which have corrupted politics, regulation and academia. 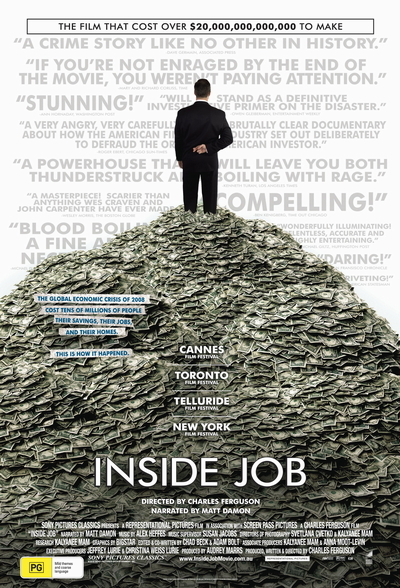 Narrated by Academy Award winner Matt Damon, Inside Job was made on location in the United States, Iceland, England, France, Singapore, and China.